As explained by Brian Barry of Multichannel Merchant, millennials make a growing cross-section of the American labor force. Ignoring this generation is impossible and attracting millennials in the supply chain is an even bigger hurdle. Since e-commerce has flooded the industry with more orders and stringent delivery expectations, supply chain leaders must think outside the box to attract and retain the next generation. In fact, millennials will make up more than 75 percent of the workforce by 2025, so it is time for supply chain executives and leaders to enact the changes necessary to guarantee success in both the current and future supply chain. Supply chain leaders and executives may have fallen victim to a series of negative stereotypes about the potential of millennials in the supply chain. Millennials have been subjected to multiple negative views about their work ethic and capability to handle labor-intensive work and overall drive. Unfortunately, failure to recognize the role millennials will play in the future of the world of supply chains will result in catastrophe. According to Kathie Karls-Bilski of Supply & Demand Chain Executive, supply chain leaders face a terrible problem; within the next few years, the numbers of retirees will reach a critical point, resulting in severe setbacks and worsening the talent gap. To stay successful, the supply chain section needs an infusion of approximately 270,000 new faces per year. 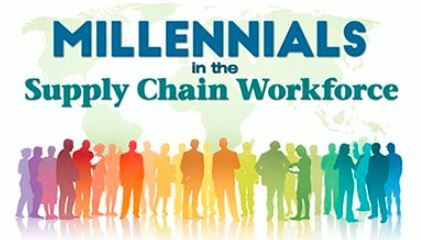 The simplest way to attract millennials in the supply chain is to change how millennials view supply chain processes. This goes back to creating a culture of acceptance of digital technologies, new standard thinking, and the use of analytics and innovative technologies, such as augmented reality and robotics, within the supply chain. For instance, implementing on-the-job management training and rotational programs encourages millennials to pursue careers in the supply chain. Millennials are more comfortable than previous generations in working with data, so the use of analytics programs in the supply chain can go a long way to attract this generation, says Supply Chain Brain. Millennials have an advantage over previous generations; they are “digital natives,” asserts John Simpson of Source Today. This means they have grown up with digital technology at their fingertips and are ready to embrace digital technologies in the workplace. Leverage automation for manual and repetitive work. Listen to and apply employee input in supply chain management. Make your career path visible. Develop an “Employee Manual” that reflects the real-world duties and expectations for employees. Upgrade systems to use new technologies, like Big Data, the Internet of Things, artificial intelligence, augmented and virtual reality and more. Train existing team members on new systems, enabling the use of mentorship, apprenticeship, and on-the-job training programs. As e-commerce surges toward a $4 trillion valuation by 2020, reports eMarketer, demand for talent in the supply chain will continue, and digital supply chains will replace the long-held beliefs of supply chain management as a “dirty, dingy, labor-intensive” career. For supply chain leaders to attract the next generation of talent, they must look to ways to improve operations and embrace the digital revolution.